Jimmy Garrison, bass; Al Harewood, drums. 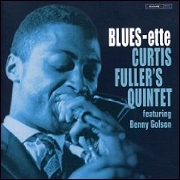 Although leadership on this album falls to Curtis Fuller, and his excitement-provoking new thoughts on trombone, perhaps the major influence in its total performance lies with Benny Golson, composer of 2 tracks, and major young jazz influence today. Fuller's 2 charts, "Blues-ette" and "Twelve-Inch" share the lean, long, spare lines of Benny's "Five Spot After Dark" and "Minor Vamp." In fact, perhaps the conception-keynote of the date is reflected in the writing. It is refreshing to note the skilled use of the sketch arrangements to provide a full-time base upon which the date was performed. Too often, of late, jazzmen write a set of skimpy lines, run into the studio, bellow the theme and then into patterns of 12-bar blues for their solo efforts. Here, in contrast, the charts written for only a 2-man front line, reflect throughout, and support throughout, a total performance, including the 2 standard tunes, "Undecided" and "Love Your Spell Is Everywhere." A major delight is the use of softer dynamics almost throughout. Much as I like Art Taylor, et al, it's a pleasure to hear bass and drums just pulsing and not melodizing! When Al Harewood solos, he blows, and when the theme calls for it, ("Blues-ette"), he cooks! When Jimmy Garrison solos, he goes . . . and at other times, he wails in the concept of the theme, (2-beat into "Twelve-Inch," melody on "Minor Vamp"). Solo chores on every track follow the continuity provided by the concept in chart. Fuller, following the change in approach apparent in his recent work, is slowly braking from the bursting, rhythmic staccato style he first greeted New York with 2 years ago, and has developed a style midway between Miles Davis and J.J. Johnson. His opening statements are usually spare, simple, and uncluttered, and his developing choruses bring back the best elements of the staccato triplets and dramatic rhythmic bursts that encircle his style. Golson, a warm-bodied tenor sax of great feeling, expresses himself sparingly and as a composer, not-blower, in his opening solo speech on each track. In the development choruses, his work now reflects more of the influence of John Coltrane, Johnny Griffin, and Coleman Hawkins. This provides an oft time confusing total impression, but adds to the drama that is so much a part of his solo approach. Tommy Flanagan, an underrated soloist of great feeling, most often utilizes the middle and upper registers in a soft-touch Bud Powell line, and gives a bonus of great rapport with the horns in this date with his introductory statements of each solo, building from the preceeding soloist's line. This, too, is further evidence of the cohesiveness that permeates the album, in contrast to the free-for-all blowing date so often encountered these days. --H. ALAN STEIN, from the liner notes.